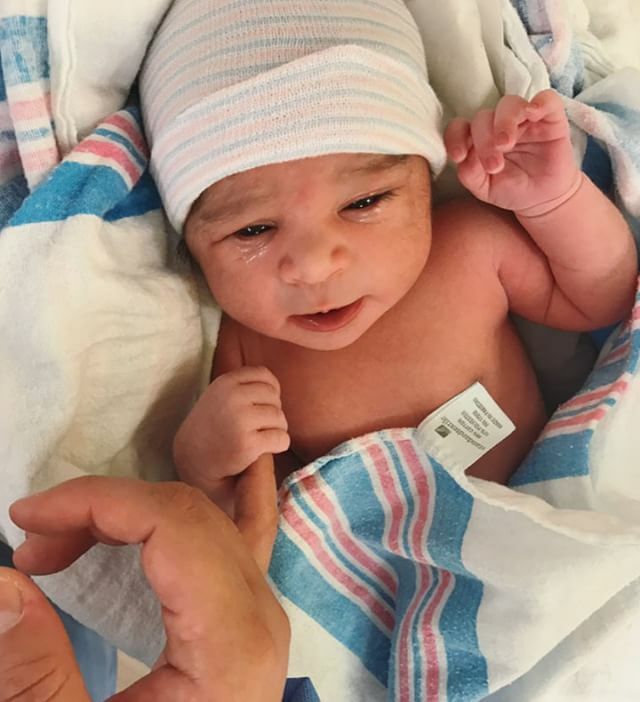 Los Angeles, CA, United States (4E) – Blac Cyna and Rob Kardashian have welcomed their first baby together and uploaded a photo of their daughter, whose name is Dream Renee Kardashian . The proud parents posted the photo of Dream on Thursday on their social media. The photo was uploaded hours after she was welcomed to the world. In the photo, Dream was seen wrapped in a blue and pink striped blanket. She was also wearing a white beanie as she held her father’s, Rob, pinky finger. Some fans of Chyna and Rob took to Twitter to express what they think about Dream’s features. Many believed that Dream looks a lot like her father. One tweet reads: “@KUWTK @Kardashianpedia kardashians have very strong genes! This baby is spit image of Rob!” Another tweet says that Dream has her father’s eyes. Amber Rose, the best friend of Blac Chyna , uploaded another photo of baby Dream and captioned it saying that Dream is a dream come true. Chyna gave birth via C-section at Cedars-Sinai Medical Center in Los Angeles. Dream is at 7 pounds and 5 ounces. Those who were at the hospital waiting for the arrival of Dream are Kris Jenner and Blac Chyna’s mother Tokyo Toni. An insider shared that everyone is doing well and that Rob and Chyna are happy that they have finally met their daughter. Dream is the first child for Rob while she is the second child of Chyna . Blac Chyna has a four-year-old son named King Cairo, whom she had with her former fiancé , Tyga . Tyga is now the boyfriend of Rob’s half-sister, Kylie Jenner . Fans will get to see more of Dream and her delivery on an E! special next month.